Alloys provide the finishing touch to any car and can turn your vehicle from an average-looking motor into a real headturner! And it’s not just about looks, an aftermarket set of wheels and tyres will often improve cornering and braking in all conditions. To put it simply, EVERYTHING! Painted, polished, split rims, lightweight motorsport wheels, chrome spinners, you name it we can suppy it! All in all, much better road handling and feel. Adding alloy wheels is probably the best and quickest way to make your car look great. And you can make your car look great in different ways. Classic; fast; street; custom, high spec; traditional; Park Lane or chic. There is a design to perfectly match you and your car. Call in to see us. We sell wheels from Wolfrace, TSW, Dezent, BSA, Rimstock, Team Dynamics, ACE, Dotz, AEZ, Fox, Momo, Speedline, Compomotive, DeCorsa, Kei Racing, Konig, Dare and any other manufacturers you care to mention! 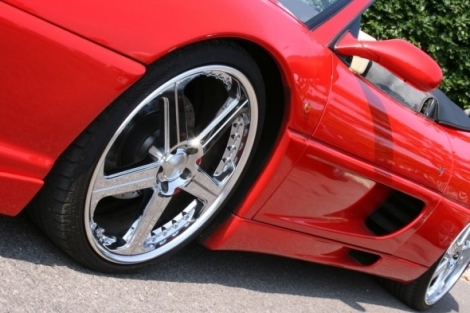 We can even get replicas of factory fitted wheels if you’re looking for a standard, but high-spec looking vehicle! Whatever car you have - Porsche or Corsa - we have not found a car we cannot fit. Call us and put us to the test..
All of our wheel and tyre packages arrive, usually within 24 hours, ready to bolt onto your car! They are delivered direct from the manufacturer with tyres fitted and balanced, spiggot rings (where required) and all the correct fixings. Locking wheels nuts can also be supplied to keep your new purchase secure! Contact us now and we’ll talk you through your options!